O. Hallesby | Pray for Revival! You are currently browsing the category archive for the ‘O. Hallesby’ category. ~ Ole Hallesby, Prayer, 15. 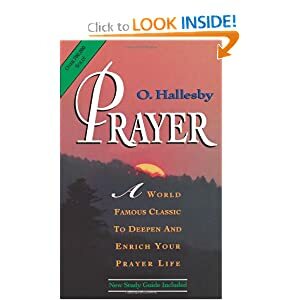 What is Prayer, According to O. Hallesby? The air which our body requires envelops us on every hand. The air of itself seeks to enter our bodies and, for this reason exerts pressure upon us. It is well known that it is more difficult to hold one’s breath than it is to breathe. We need but exercise our organs of respiration, and air will air will enter forthwith into our lungs and perform its life-giving function to the entire body. The air which our souls needs also envelops all of us at all times and on all sides. God is round about us in Christ on every hand, with His many-sided and all sufficient grace. All we need to do is to open our hearts. Prayer is the breath of the soul, the organ by which we receive Christ into our parched and withered hearts. Do We Have What It Takes For Intercessory Prayer? Intercessory prayer…will necessarily require time. No one else, therefore, will be able to do it except those who are willing to sacrifice the time to do it. This alone is sufficient to make it clear to us that the work of intercession can be done only by those who are willing in spirit. All others will find more than enough excuses for not doing it. One excuse will be that they have not the time and cannot arrange to take the time. As far as I can see, prayer has been ordained only for the helpless. It is the last resort of the helpless. Indeed, the very last way out. We try everything before we finally resort to prayer! Do We Open the Door For Jesus Through Prayer? To pray is nothing more involved than to open a door giving Jesus access to our needs and permitting Him to exercise His own power in dealing with them. He who gave us the privilege of prayer knows us very well. He knows our frame; He remembers that we are dust. That is why He designed prayer in such a way that the most impotent can make use of it. For to pray is to open the door unto Jesus. To pray is nothing more involved than to let Jesus into our needs. To pray is to give Jesus permission to employ His powers in the alleviation of our distress. To pray is to let Jesus glorify His name in the midst of our needs. How Watchful Are We in Prayer? The most difficult prayer, and the prayer which, therefore, costs us the most striving, is persevering, the prayer that faints not, but continues steadfastly until the answer comes (Prayer, 112). And we even pray a little for them. What Should Be Our Number One Complaint in the Church? “What we really should complain most about is ourselves and our own slothfulness in prayer” (Prayer, 71).